I love it when she changed the cooking method to one that I will not shy away from and it's a lot healthier too. Using and wasting much less oil. The fried coconut lends a very special aroma to the chicken and it's hard to describe. Just one rant about this dish, too much coconut, LOL. Or maybe I packed the coconut too much into the cup. Silly me. Other than that, it is absolutely delish! I maybe the only one who loved the scraps and it was too much for me to handle, alone. 1. Lightly toast the coriander seeds in a pan until you hear some popping sounds. Transfer it to the mill together with black peppercorns and grind. 2. Place ground spices, wet paste, water, salt and sugar into a pot or wok. Mix to combine. Bring it to a boil and put in chicken pieces. Let it cook for about 10 minutes on medium heat, until the chicken looks half cooked. 3. Transfer the chicken pieces to a tray and grill at 200C for 10-15 minutes or until the skin look golden. 5. Put chicken pieces back in and fry everything until it looks beautifully golden and dry. Here ends my Ayam series. By the way, for those who didn't know what is Ayam, it's chicken in Malay, hence the dishes are all Malaysian and Indonesian in origin. 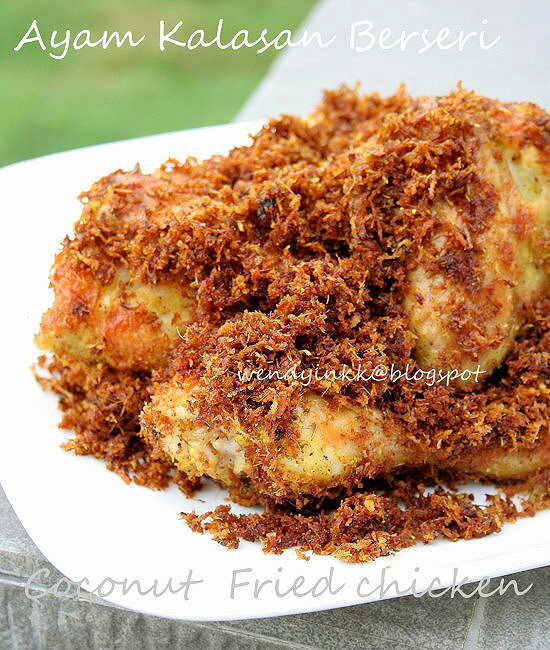 This dish is something new to me as I never heard of this Chicken Fried in Dry Coconut. Got to try this one day. It must be full of aroma and real delicious. This dish is a first for me. Never seen it before so I am quiet excited. I think I will love it, all that coconut scraps is yummy! Have a nice break. You need that after supplying us with so many delicious recipes. Your blog is like a "bible" to me. Thanks. Happy Holidays ! i am going to make this .. you make it looks delicious!!! This looks very easy n delicious!! Gempaklah! Dengan rendang, masak merah and yang berseri2 ni, semuanya nampak best betul! Macam nak raye je ni :) Happy Holidays! All three ayam dishes also nice but I like the ayam masak merah best:D Just love that! Happy Holidays! 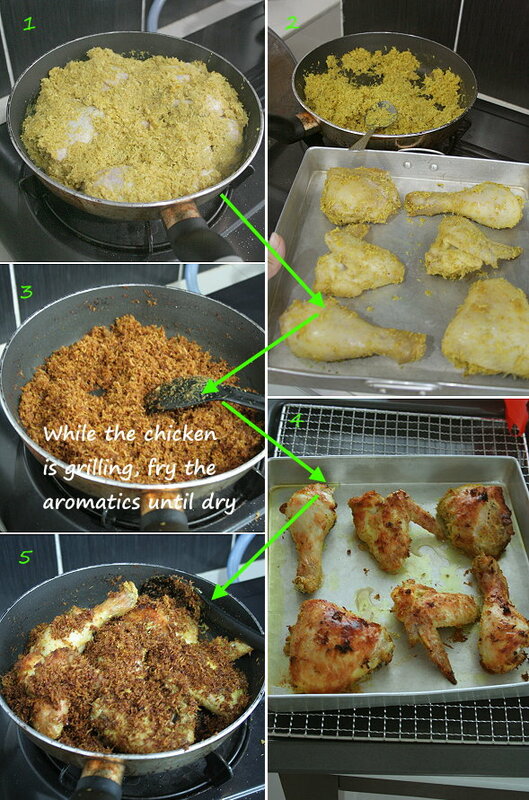 Your fried chicken looks very fragrant with lots of extra extra extra crunch from the dry coconut sambal. Agreed with Mai Lin too that your blog is like a cooking / baking bible to me. You deserved a break being such a brilliant blogger. 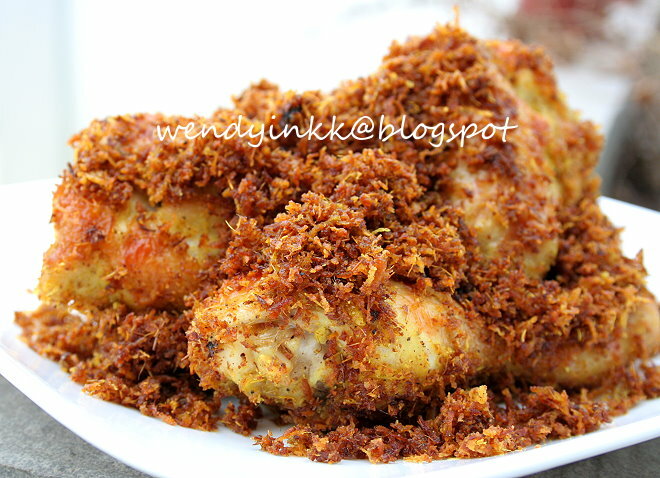 Wendy, another recipe to try out, my favourite ayam recipe, yum! The Malaysian and Indonesian origins are meant for all 3 recipes featured for this week, notice the word "series". My source did mention ayam kalasan is from Indonesia, and I think there are many versions of rendang, but as far as I know the version is I did is the version found in Negeri Sembilan, made by Minang community. Ayam masak merah, I have no idea as there is no information about its origins on the internet, but it's popular Malay dish here. I wonder if you can explain to me and my readers about the origins of these three dishes, we will be glad to learn more of your country's cuisine. Dear Wendy, irregardless of what others say about 'respect', I believe all our dishes, be in Malaysian, Indonesian, Singaporean etc are all infused and adapted throughout generations and most of the time, there is a tendency to alter and differ from the original recipes. Hence we have Thai-Malaysian cuisines, Indonesian-Malaysian cuisines and so forth. I don't see it as any problem with your blog contents above hence I think you can ignore those who are 'unhappy' and move on. I do thank you for featuring your ayam series and I have tried one, gonna try this one tonight. Thank heaps.